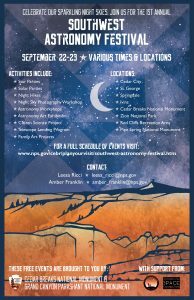 Southwest Astronomy Festival is a regional celebration of astronomy and dark skies on September 22-23, 2017. The festival will consist of events for all ages taking place throughout Southwestern Utah at various times. Come experience night sky art exhibitions in Cedar City, attend a star party in Cedar Breaks National Monument, go on a night hike in Zion National Park, and look at the Sun from downtown St. George. 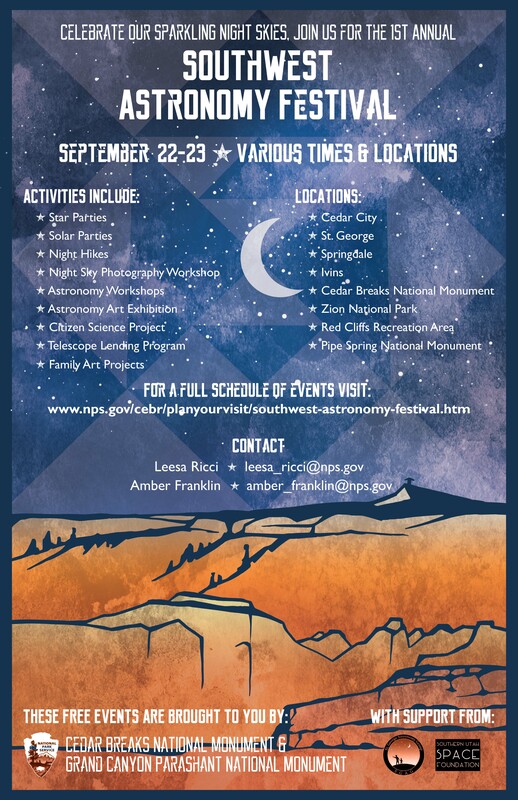 Click here for a PDF of the Southwest Astronomy Festival brochure. For updates on the festival, visit the www.nps.gov/cebr/calendar or follow Cedar Breaks National Monument on Facebook at @CedarBreaksNationalMonument. A thin crescent moon this weekend that will make for great viewing in the event but will set early enough to permit dark skies later in the evening. Venues in Iron County include the Southern Utah Museum of Art, North Elementary, Cedar City Library, Artisans Art Gallery, Cedar Breaks National Monument, Cedar Canyon Nature Park and the Ashcroft Observatory.